On Friday November 23, 2018, the Asper Centre’s Executive Director Cheryl Milne will take part in a panel about reconciling children’s rights and donors’ rights as part of a HEALTH LAW, POLICY AND ETHICS IN CANADA interdisciplinary conference titled “Regulating Creation and the Assisted Human Reproduction Act”, which will take place at the University of Toronto Faculty of Law. Since the adoption of the Canadian Assisted Human Reproduction Act in 2004, assisted human reproduction has been developing at a very fast pace at a global scale, in a complex social, medical and industrial context. An early challenge of the legislation by Quebec in 2010 resulted in the removal of many key components of the legislation, particularly those related to the regulatory control and licensing of assisted human reproduction. New scientific developments, in particular those related to gene editing, have also inspired calls for changes to the remaining prohibitions. Both the federal government and the provinces are under pressure to re-imagine how assisted human reproduction should be regulated and funded in Canada. Since the Supreme Court’s decision, there have been new funding initiatives at the provincial level, and ongoing debate, yet limited action at the federal level with respect to the development of regulations about surrogacy and gamete donation. A recent proposal to repeal the Act’s prohibitions on payment for surrogacy and the purchase of gametes has renewed debate over the remaining criminal law-based restrictions. And while other countries have moved away from anonymous gamete donation, Canada’s legislation and case law continue to allow anonymity. Meanwhile, many investigative reports and scholarly research into assisted human reproductive practices, including surrogacy and gamete donation, have shed light on what is happening on the ground, and on the multitude of personal, economic, ethical and legal ramifications of Canada’s assisted human reproduction practice. 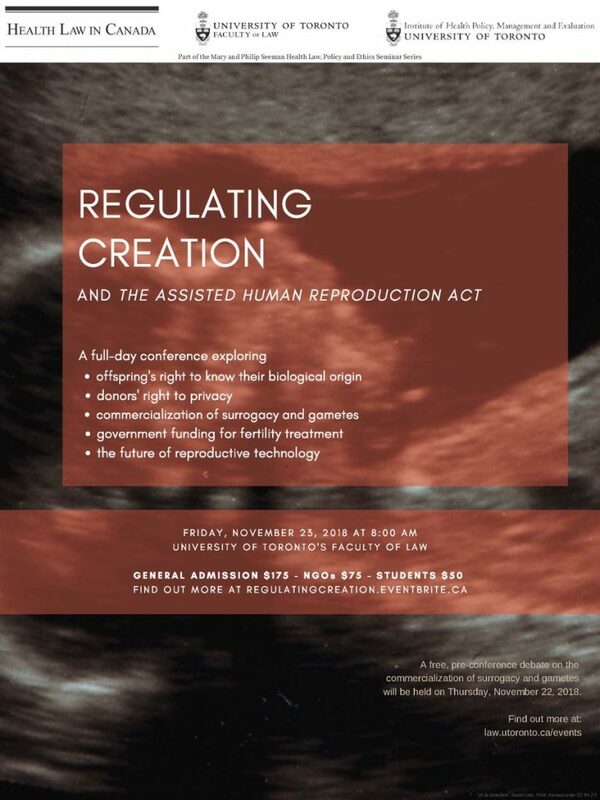 This one-day colloquium, preceded by an evening debate, will explore a number of key issues related to Assisted Human Reproduction. Read the Regulating Creation – Agenda as of 12 Nov 2018 and to register for the Conference, please Click Here.